Although ASMC struggled to balance their budget this semester, their finances seem hopeful for next semester. Next year, The Campanil will be one hundred years old. Anthropology professor Ann Metcalf is retiring after 32 years at Mills. 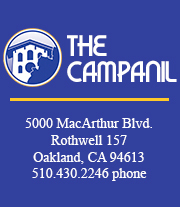 Opinions editor Dajanae Barrows says a bittersweet goodbye to the Campanil. Dr. Bruce Williams leaves behind a legacy of social change agents and critical thinkers after 18 years at Mills.